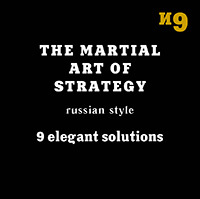 The elegant Solutions by Igor Grishin and Mikhail Emelyanov are 9 stratagems of Russian civilization. All of them together create a harmonious, strategic framework as each solution carries historical, economic and military examples. This is a high-quality strategy development, which does not have foreign analogues. I. Grishin, M. Emelyanov. — 192 p.
Купить книгу за 150 р.